A Perfect Lie - Una Mentira Perfecta ™: Fly Like an Eagle! 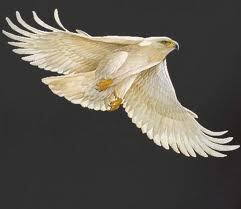 Yesterday afternoon I saw a white eagle in the tree in my backyard. I've never seen an eagle up close before and I didn't know white eagles even existed. The wing span was huge and I couldn't stop staring at it. Most of my regular readers know my life has been quite difficult for awhile now. I've been close to giving up and running away. Lately things have gotten better. I have hope for the future. The white eagle sighting confirmed it. God works in mysterious ways.